Langtang valley is a peaceful and exotic place on the lap of Langtang Himal. This is among the most adventurous treks in a close proximity to the Kathmandu valley. Because the region is close to Kathmandu, the Langtang trek cost is fairly cheaper than other treks in Nepal. 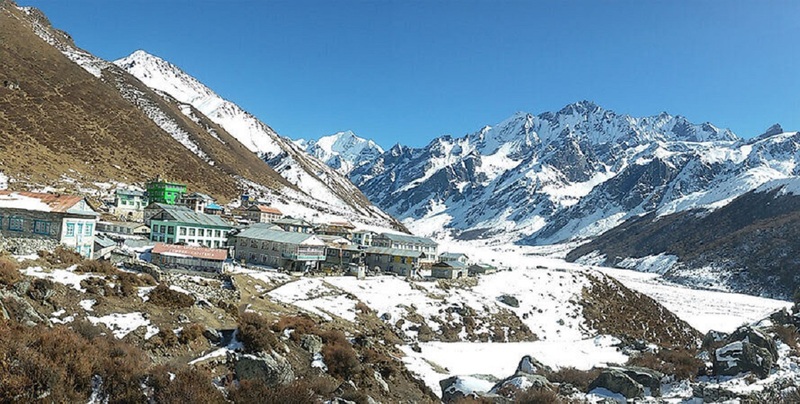 After paying an amount of around USD 500 – USD 900 you will get to earn lifelong memories in this land of bliss and purity during the Langtang Valley trek. 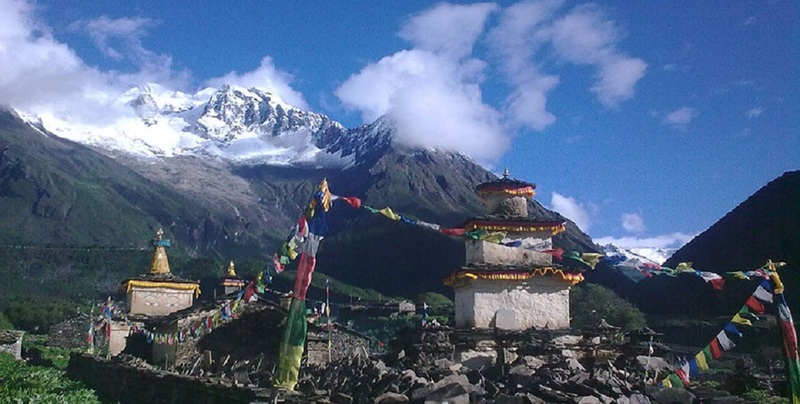 You can walk to Kyanjin Gompa and catch the stunning views of Langtang Lirung. Or, you can trek to Gosaikunda and 108 other glacial lakes for spiritual cleansing within the limit of this budget. So, why not venture to this adventure of a lifetime. This is a moderate trek which offers the stunning scenery of the mountains, landscapes, and the typical Tamang settlements in a couple of days. You do not have to wait or trek long to reach to this vicinity of mountains. The natural rivers and waterfalls, high altitude meadows and pastures, glacial lakes, and the rugged terrains on the Tibetan Border are sure to keep you enticed all along the trek. The virgin trails with fewer trekkers but an abundance of vegetation in the lush forests of Langtang region adds a bonus to the trekkers. As the trek route is quite easier you can either go with a travel company, or hire guides/ porters, or you can go on solo treks as well. And, there are numbers of trekking trails and the routes to reach Langtang valley. Whichever way you go, either go with a group or solo, all you collect is the fondest memories in the cultural, natural, and the geographic diversity of the village. You can choose Langtang Helambu trek, Langtang Gosaikunda Trek, Langtang Kyanjin Gompa Trek, and many other treks in this region. How Costly is Food and Accommodation During Langtang Trek? How Does it Cost for Guides and Porters? What Should I not forget in Langtang Valley Trek Cost? Langtang National Park Entry permit: USD 30. You can collect these permits from Nepal Tourism Board Office Kathmandu. After submitting the photocopy of your valid passport and a passport size photograph. Or, you can collect them at the checkpoint in the trailhead. But, the price may go a bit higher in the trail heads than in Kathmandu. Also, if you plan to trek through Sundarijal-Chisapani route to enter the Langtang valley you need to buy a Sivapuri Conservation Area Permit: USD 5. You can get the entry permit at the trek head, Sundarijal. In general, the Langtang Valley trek allows you to explore this land of glaciers from a week to 12 days. Depending on your time convenience you can choose how long to stay in this valley. And, based on the duration of this trek, the cost also varies. The longer your trek is, the more you will be spending on the trails. The cost of food, accommodations increases. So, does the total Langtang trek cost. So, if you want to reduce the cost of the trek, you can plan the short itinerary or a week-long itinerary. 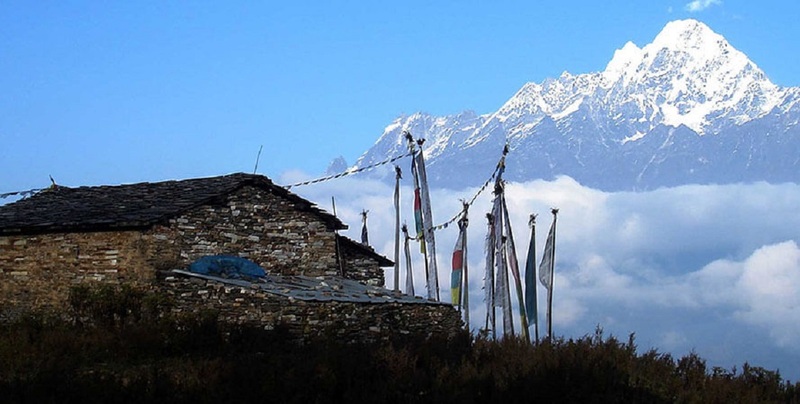 There are many tea houses and lodges available during the Langtang Valley trek. Although you will find basic places for food and accommodations you have to pay a certain amount for the service provided. In general, you can find a simple room for USD 2-5 per night. Also, note that the rooms are on a twin-sharing basis. You have to share the toilets as well in many tea houses en route. However, there are enough hotels a,d lodges with the sophisticated facilities in Kathmandu. Accommodation in Kathmandu may cost you around USD 5-250 per night. Also, you will find different types of food products in the Kathmandu valley. You can enjoy from the Nepali staple food Dal Bhat tarkari to different continental dishes. Just order, and everything will on your table. For such services, your cost ranges from USD2- USD25. It depends on what you choose to eat and where. Whereas as you leave the valley and proceed towards the Langtang valley, your choice of food also limits with the decreasing number of tea houses and the services they offer. The tea houses along the route offer Dal Bhat and seasonal vegetables. Plus they have momo, chowmein, noodles, pizza, fried rice, tea, coffee, and soup on their menu. Just pick your right craving. For such food, you will be spending around USD3-USD6 per day. Also, you can get hot water after paying USD 1- USD3. If you spend the night at the same tea house where you had food, then they may negotiate on the cost of food, rooms as well. Guides and porters are your company when you go on treks. Along with that, they guide you all along the route, prevent you from missing the trail, give you information about the flora and fauna en route. Also, they will narrate you stories of different place and detail you about the mountain ranges as seen from the route. And they also tell you about what you should not miss during the trek and share you the best photographic destinations. So, while hiring a guide or porter you will be in a bonus in many ways. To hire a licensed guide you have to pay around USD 20 – USD 25 per day. Also, you will pay for his/her meals and room. Whereas hiring a porter is cheap than the guide. You can hire a porter for USD 15 – USD 20 per day and additional cost for food and accommodation along the route. However, if you do not want to spend on the guides and porters you can do solo trekking as well. You have to manage everything by yourself and take care of yourself too if you go independent. The only way to enter and trek to Langtang region is either by the public bus, tourist bus, jeep or trek from Sundarijal-Chisapani. These means of transportation takes you to Syabrubeshi, trekhead, from Kathmandu valley. As per your preferences and how much you like to spend on transportation you can change the modes of transport. If you are in no hurry and want to go on long drives hearing and seeing the stories of locals then choose the local bus. Or, you may want to travel privately in full comfort, then choose a taxi. Or, if you want to travel in a comfortable tourist bus in luxury then they are available too. Or, you can arrange a group and travel in private jeep for short and comfortable ride. Local bus- USD 3 per person. Or, if you do not want to spend the cost on these modes of transportation then you can choose to trek from Sundarijal to enter Langtang valley. Sundarijal is about 45 minutes drive from Thamel and you will reach there in around USD 1- USD 5. The cost of trekking gears and clothing is completely subjective. It depends on what you want to buy, what to rent, and what you want to use that you already have. You can rent some of these trekking gears in Kathmandu for USD 1 – USD 10 per day. Or, you can bring the things you already you have in your home to reduce the cost. Except for the necessary places to spend your money on, you may also want to spend additional money on things that make you happy. You may spend the cost while buying the souvenirs or unique things from Nepal to gift to your loved ones. Plus, you may like to donate some amount on the monasteries, local school, community health post to assist them financially, although through a small amount. Also, you may like to reward your guide or porter with their cooperation and proper guidance during the trek. So, you may like to tip them some amount. At some places you may have to pay USD .5 -USD 3 to use the WIFI service or to charge your electronic gadgets. 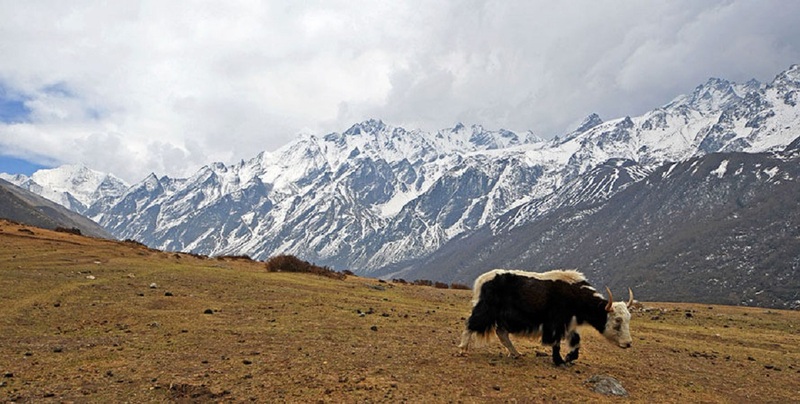 There are a few things you should not undermine while going on the Langtang valley trek. You will be spending your money on the trek but before you spend pay attention to these tips as well. Most of the tea houses and lodge en route accept Nepali currency only. So, do not forget to exchange enough Nepali currency before you leave for the trek. Always carry hand cash. There are few or no ATMs available in the trek route. You won’t be able to withdraw cash when in need. So, carry enough cash before you leave. You can bargain for the rooms, food and their cost in the tea houses. Also, you can bargain while hiring local porters. This way you can control the excess expenditure. Hire a porter-guide. This way you can deduct the individual costs you spend on guides and porters. Rent the trekking gears that may be unnecessary for you after the trek. Do not forget to get a valid travel insurance before you come to Nepal to join treks. Trekking is adventurous and risky at the same time. So, get the policy that covers you during emergencies, has helicopter evacuations, and covers up to the height of 6000 meters. Learn properly about altitude sickness, its symptoms, and preventive measures. Drink plenty of water. Maintain hydration. Carry along water purification tablets or purifiers. You may not get boiled or filtered water everywhere. Walk slowly, take proper rest. Mark the maximum altitude you covered in a day and proceed accordingly. Pack light! Pack Wise! Look for the weather and the temperature of the month you are opting for this trek. If you are a novice trekker, then better choose the peak season for trekking in this region. During that time you won’t face the harsh weather and temperatures. You can choose Langtang trek in Spring. Budget plays important role in making your trek memories. You must be careful on what to spend and what not to. Plus, you should not compromise on the necessaries in the Langtang trek cost. First know where to spend, how much to spend, and how to spend. Then you will have happy trekking without excess expenditure. For further information on Langtang trek cost or any other treks in Nepal, contact us.